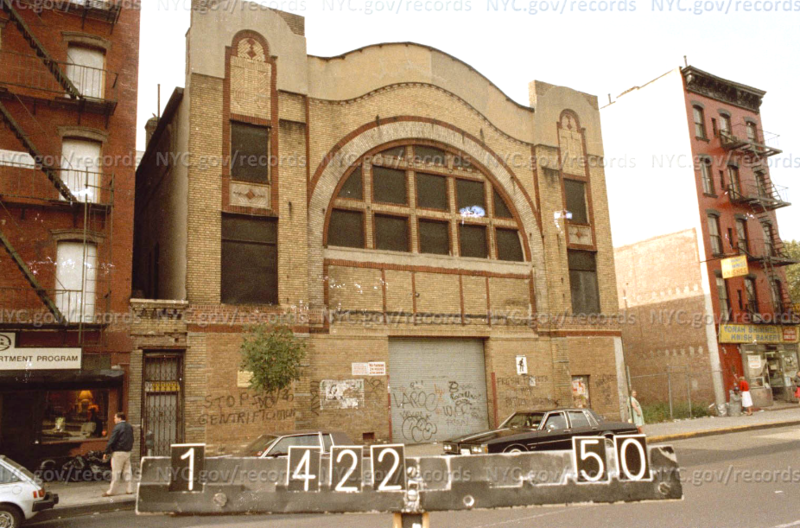 For almost two centuries, 143 East Houston Street has been many things to many people, from a church to a fight club to an indie movie house. Now it’s destined for the wrecking ball, to be replaced by a $30 million office space. 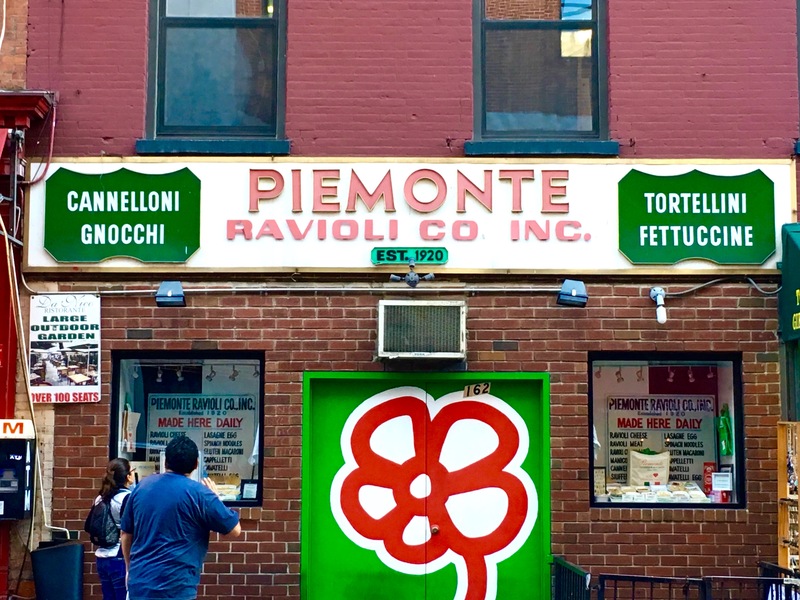 Let’s pay homage to this remnant of another city by looking at all the ways it served New Yorkers for 180 years. Some of its history is murky, such as its beginnings as a church. It’s not clear if it started out as a Dutch Reformed Church built in the 1840s (as a 2018 New York Times piece has it) or a German Evangelical Mission Church, dating back to 1838, stated The Real Deal. 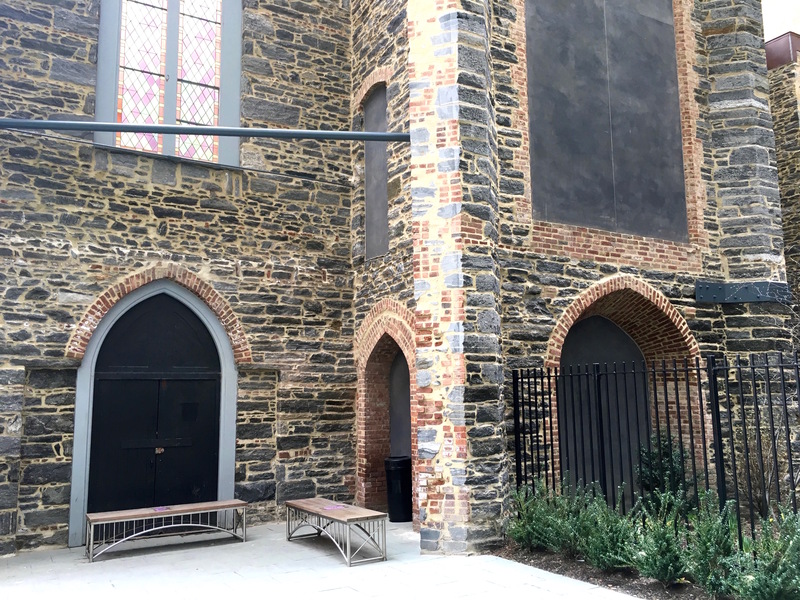 By the late 19th century, a church and two parish houses on the site were run by German evangelicals, who perhaps also used the buildings as an immigrant meeting hall. 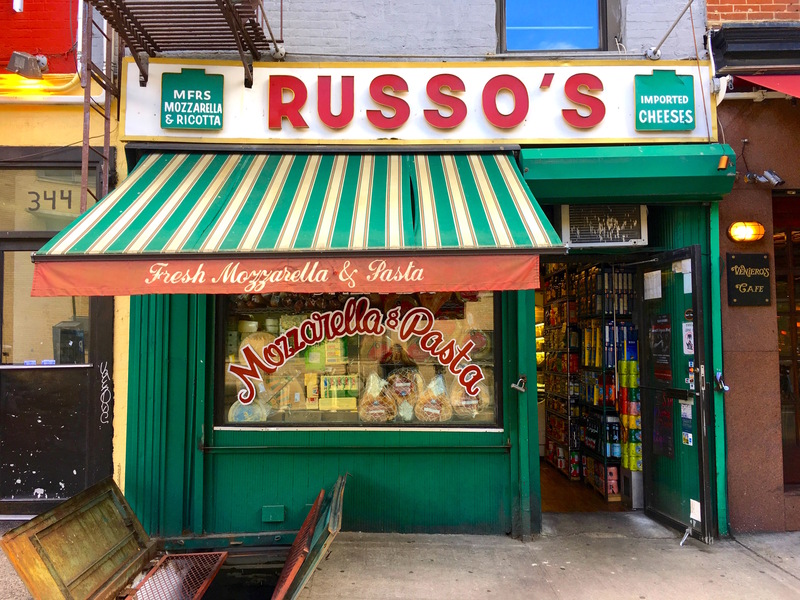 Remember, East Houston Street at the time was squarely in Kleindeutschland—the city’s vibrant Little Germany neighborhood. By the early 1900s, Little Germany was departing for Yorkville, and 143 Houston became a fight club. “The building’s showbiz debut probably came in 1908, when Jack Rose, a gambler and minor figure in organized crime, painted over the religious scenes and held prizefights there, calling it the ‘Houston Athletic Club,'” stated The Village Voice in 2001. 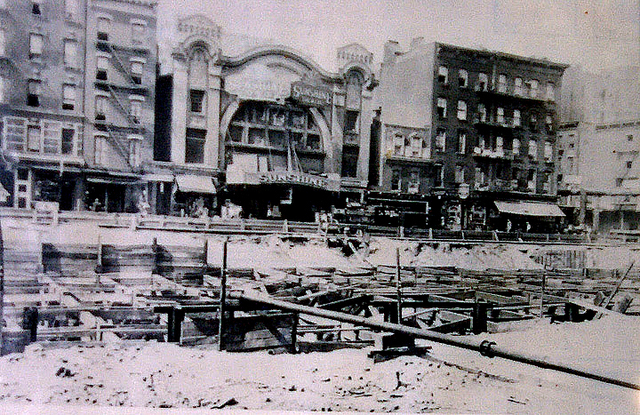 East Houston by then was also part of the burgeoning Yiddish theatre scene. What would come next? A nickelodeon featuring Yiddish movies and vaudeville acts—run by an enterprising guy named Charlie Steiner. 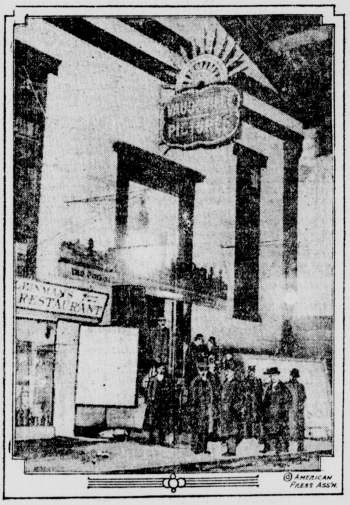 “With minimal modification, the Athletic Club became the (above right) ‘Houston Hippodrome’: The entrepreneurs converted the pulpit into a stage, put the projection booth in the organ loft, and left the wooden pews,” according the The Village Voice. 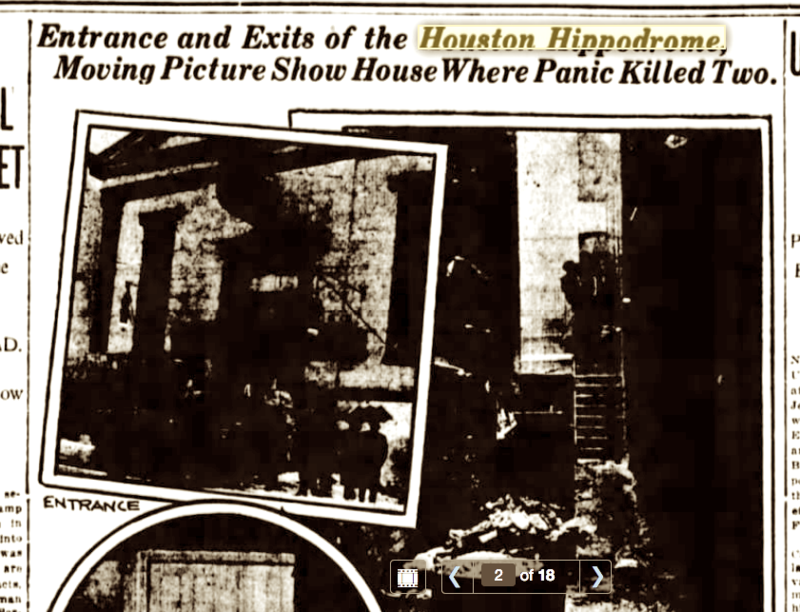 In 1913, the Houston Hippodrome was the site of a deadly stampede (above left). A projectionist thought he saw smoke and yelled fire! into the audience. Two patrons were killed. The incident made headlines for weeks as city officials recognized the building as a potential firetrap. “The old church building is dry, worm-eaten tinder, which would need nothing more than a match dropped in a corner to spring into blaze,” the paper quoted the coroner. In 1916, Steiner rebuilt the Houston Hippodrome, with some of the wood from the old church still remaining, according to some sources. 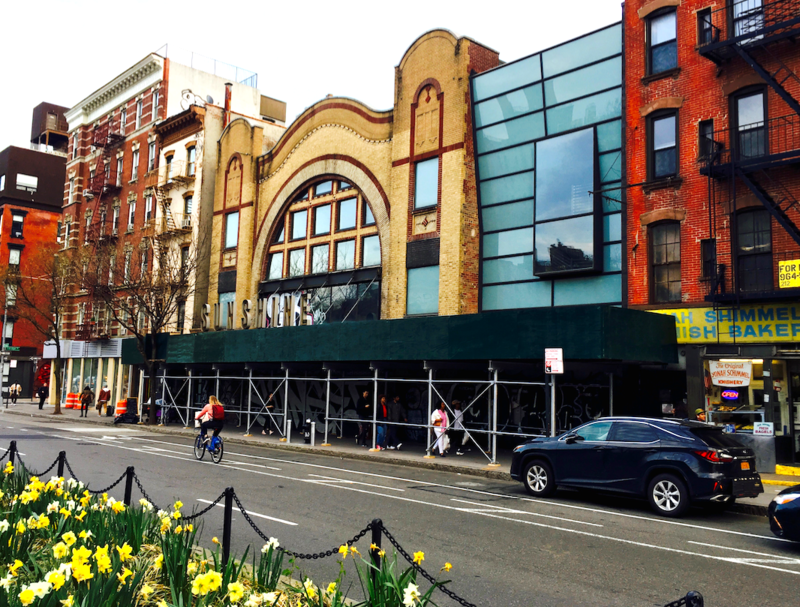 He reopened it a year later as the Sunshine Theater (above); the name was changed in the 1930s to the Chopin Theater. By 1945, the curtains went down and the building was turned into a hardware warehouse (above, in the 1980s). 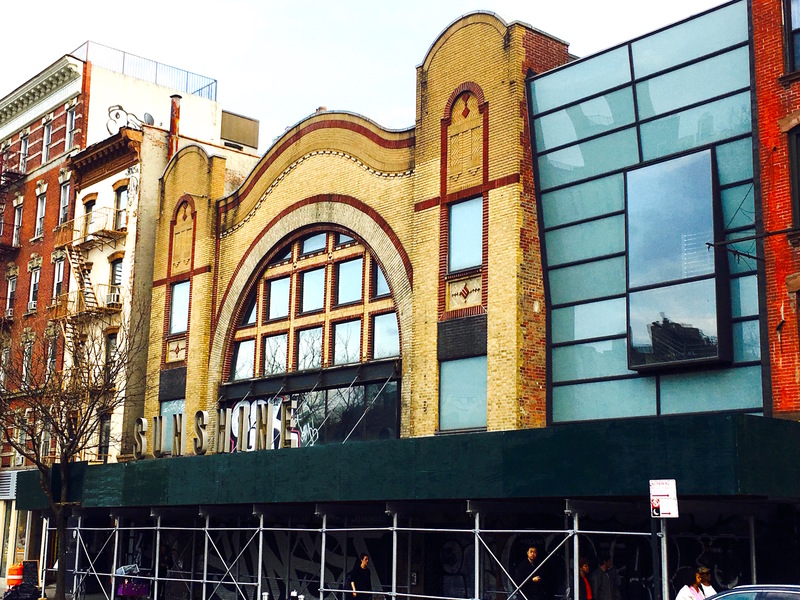 In 2001, a restored and refurbished theater became the much-loved Landmark Sunshine Cinema. Today, it’s now the much-mourned Landmark Sunshine Cinema. The doors have been bricked in (above right) since 2018, and the unique facade stands defeated, awaiting its fate. 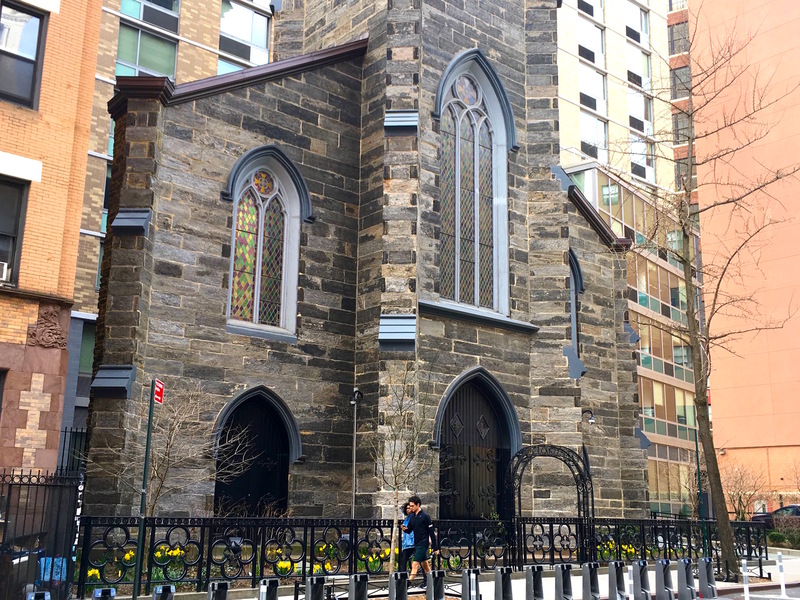 You can see it from Fourth Avenue as you approach East 12th Street: a weathered gray stone facade with enormous arched stained glass windows topped by a tower. It all feels right out of the Middle Ages. But when you get closer, something’s amiss—the rest of the church is missing. 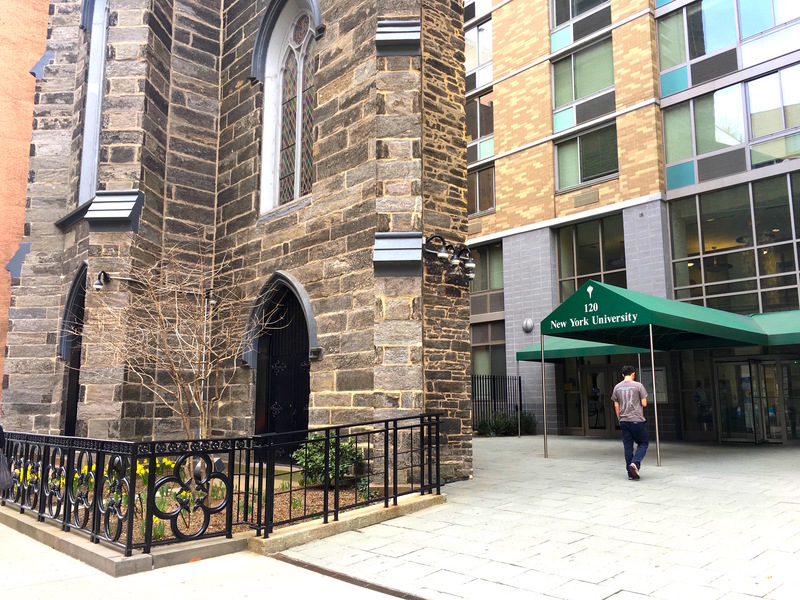 Instead, there’s a 26-story dorm built by New York University, with a couple of benches on the other side of the thin facade, where the sanctuary of the church should be. 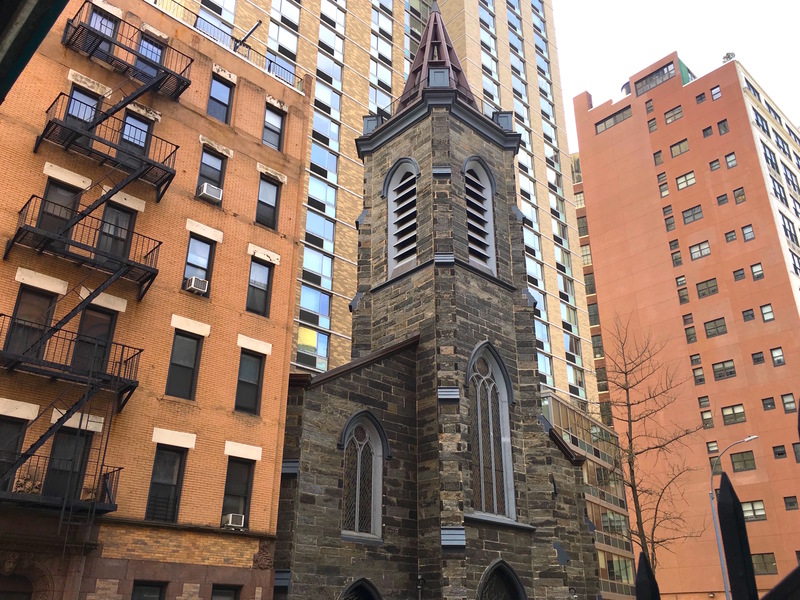 The story of this shell of a church on a tidy East Village block begins in 1848, when the original church, the Twelfth Street Baptist Church, was constructed, according to David W. Dunlop’s 2004 book, From Abyssinian to Zion. The church changed hands quickly. 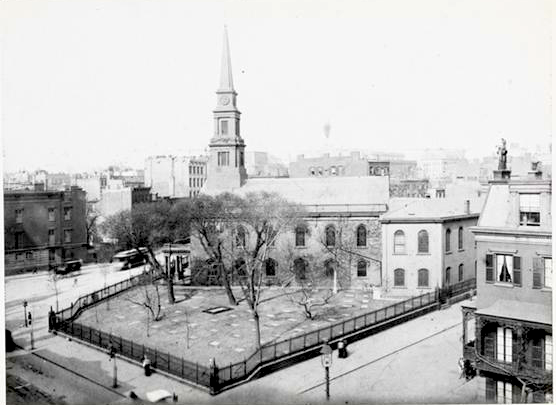 By 1854 it was Temple Emanu-El, which soon moved uptown. In the 1860s, it became the new home of St. Ann’s Roman Catholic Church. 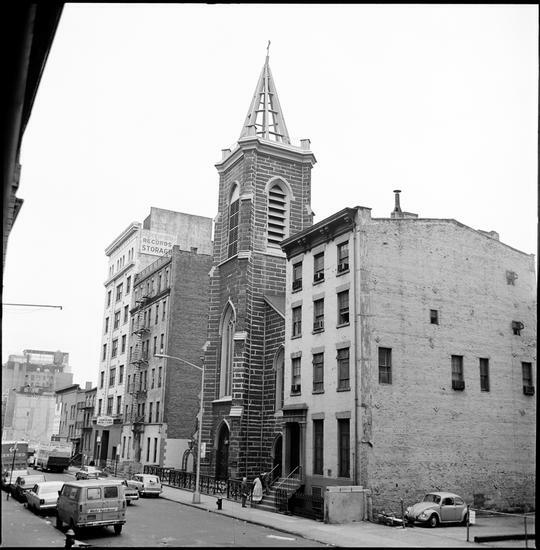 Congregants at St. Ann’s razed the original church building except for the facade and tower. They commissioned architect Napoleon Le Brun to construct a Gothic church sanctuary stretching all the way to 11th Street, which was dedicated in 1871, wrote Dunlop. But the parish began dwindling in the second half of the 20th century. In 1983, St. Ann’s became St. Ann’s Armenian Catholic Cathedral. Twenty years later, the Archdiocese of New York announced that St. Ann’s was closing for good. A developer then bought the building with plans to bulldoze it and put up a dorm. Despite an outcry from preservationists and neighborhood residents who didn’t want to see the lovely church turned into a pile of rocks, St. Ann’s was torn down in 2005 (along with an 1840s rectory building next door). In something of a victory for the city, the developer left the slender 1848 facade and tower. They stand disembodied from their sanctuary and strangely unconnected to the dorm behind it…and the street they’ve called home for 171 years. 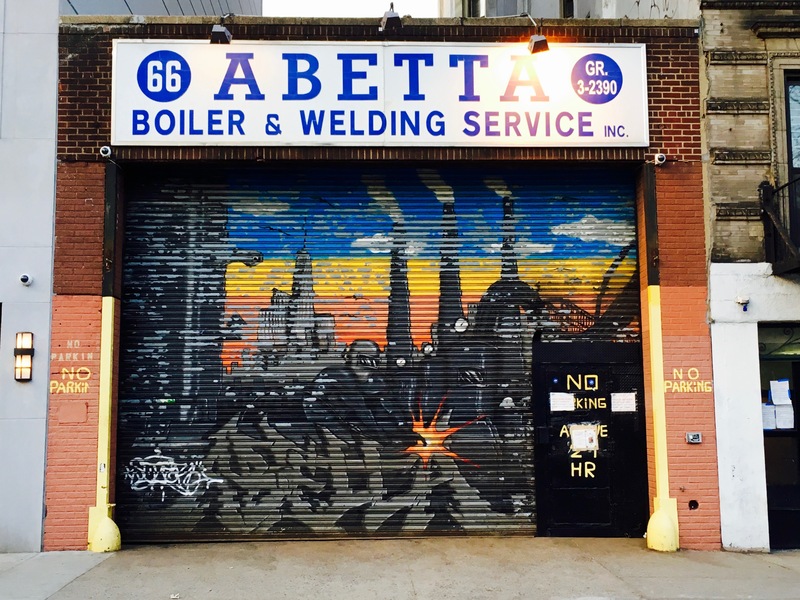 How long has Abetta Boiler & Welding Service been building and repairing the infrastructure of New York City? 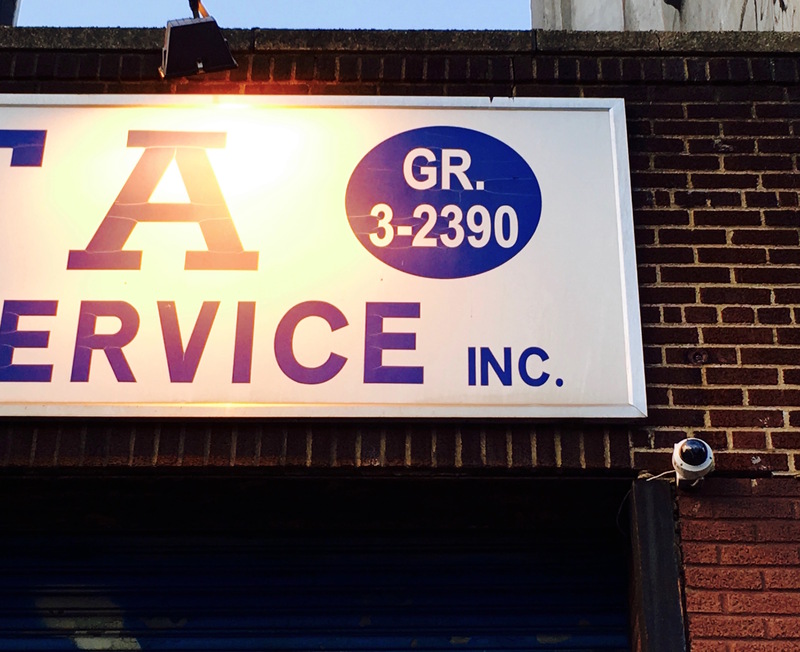 At least since 1957, according to a listing in the Greater New York Industrial Directory. And that makes sense, based on the old two-letter phone exchange that’s still on the company sign over a garage on East First Street in the East Village. 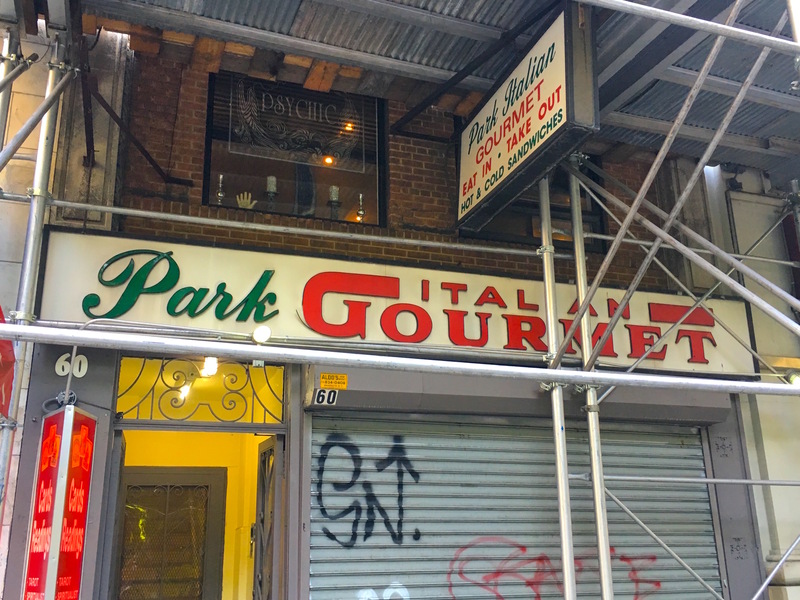 GR for Gramercy? Greenwich? It’s hard to know, as it’s been more than 50 years since the two-letter exchanges were phased out in favor of digits. 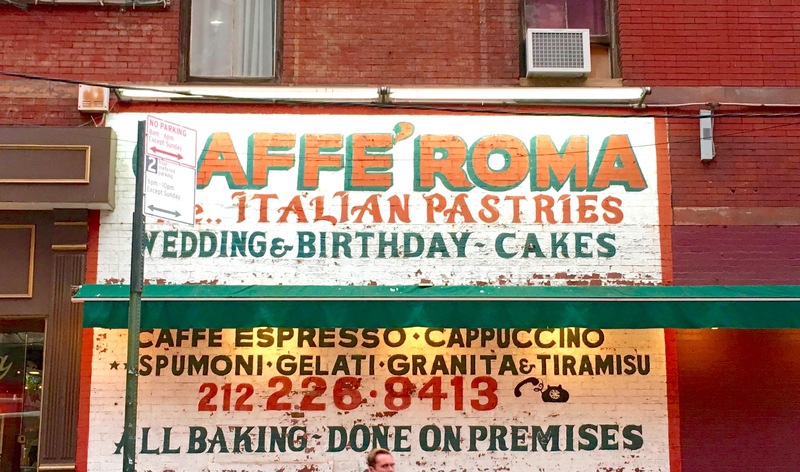 It’s getting harder to spot some of these old exchanges on signs and storefronts, but the Abetta sign stands as a reminder of what phone numbers used to look like in New York. 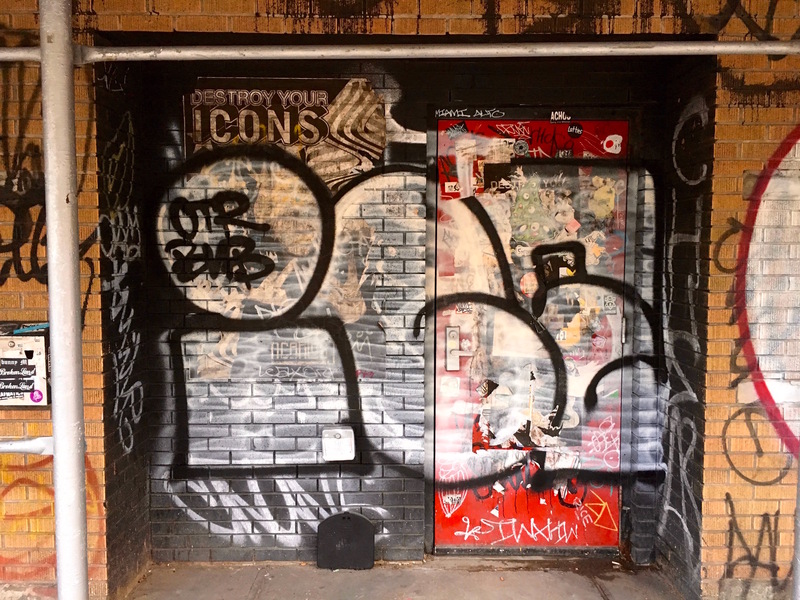 The artwork on the garage door is an appropriate ode to an old-school Manhattan business, too. A shapely woman holding (posing?) with an umbrella in front of a brightly lit store window. A statue outside a cigar store. 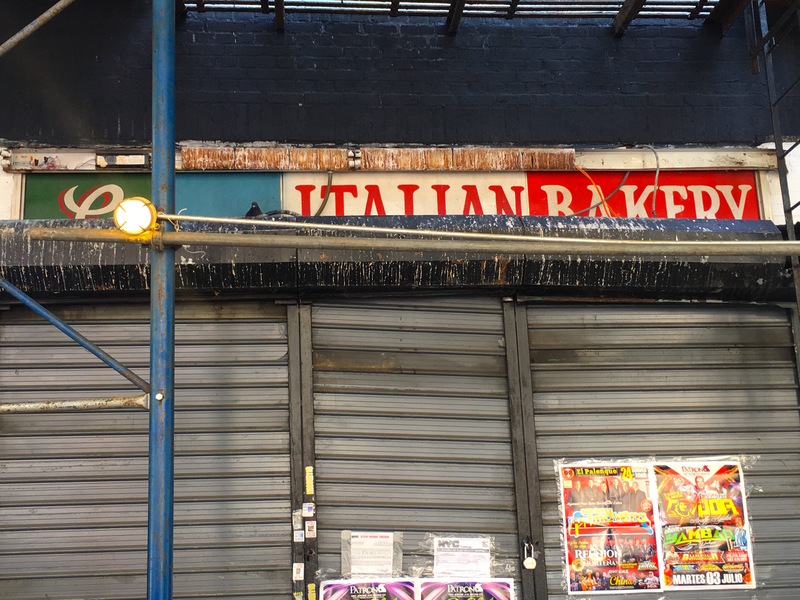 Car lights up ahead, under the hulking steel tracks of the elevated train, making the Bowery appear darker and more ominous than usual. And in the background beyond the cigar store are at least two men, forced by the rain and probably circumstance into the shadows of New York’s most blighted skid row at the time. 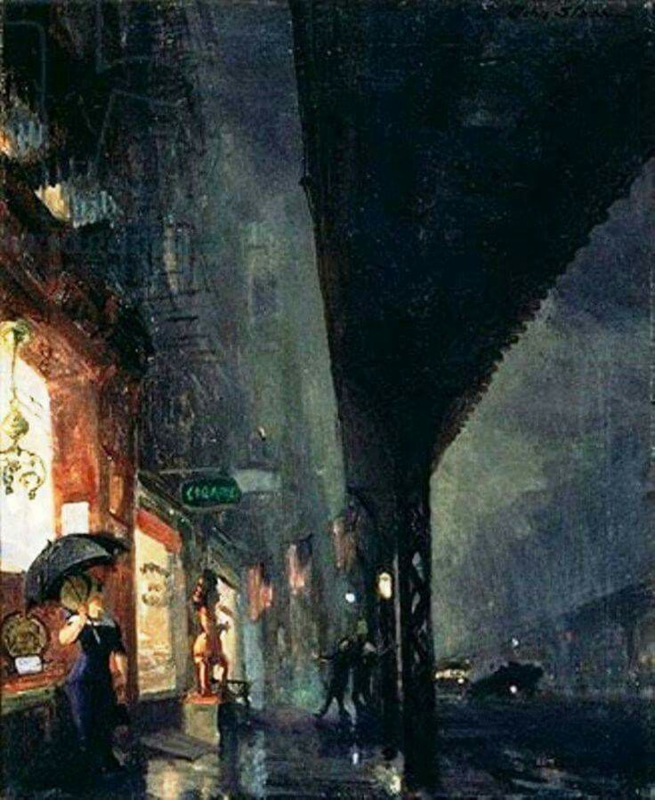 This is how John Sloan saw the Bowery one wet night in 1911. 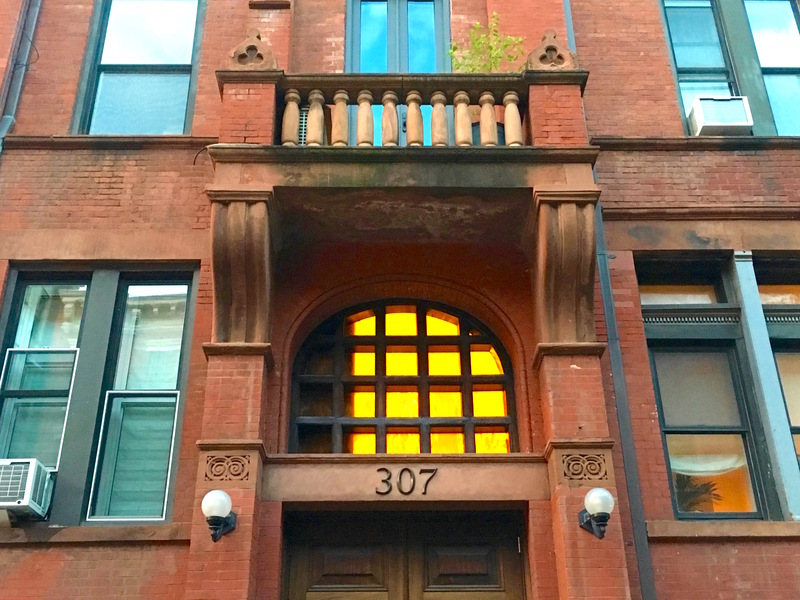 There’s an unusual red brick building at 307 East 12th Street that has Victorian Gothic bells and whistles mixed with a Flemish-style gabled roof. A home? A school? Turns out this four-story beauty originally served as both when it opened in 1892 as the Elizabeth Home for Girls. Run by the Children’s Aid Society, one of many organizations dedicated to benevolence in the Gilded Age city, the Elizabeth Home took in girls whose families were either too poor to take care of them—or who didn’t have families at all. “Elizabeth” was the name of a deceased sister of Emily Wheeler, a New Yorker who first used her wealth to fund the earliest day nurseries for the kids of working mothers before purchasing the land on East 12th Street and turning her attention to the plight of homeless girls. The goal was to help girls avoid the “evil influences of the streets,” according to an 1893 Times article. Dormitories and bedrooms were on the upper floors, along with a dressmaking workroom. The first floor and basement consisted of a laundry, typing room, dining room and kitchen, and sewing machine area. By “school,” the Children’s Aid Society didn’t mean reading and writing so much as preparing the girls who lived here to earn a living. The building’s architecture might look familiar. 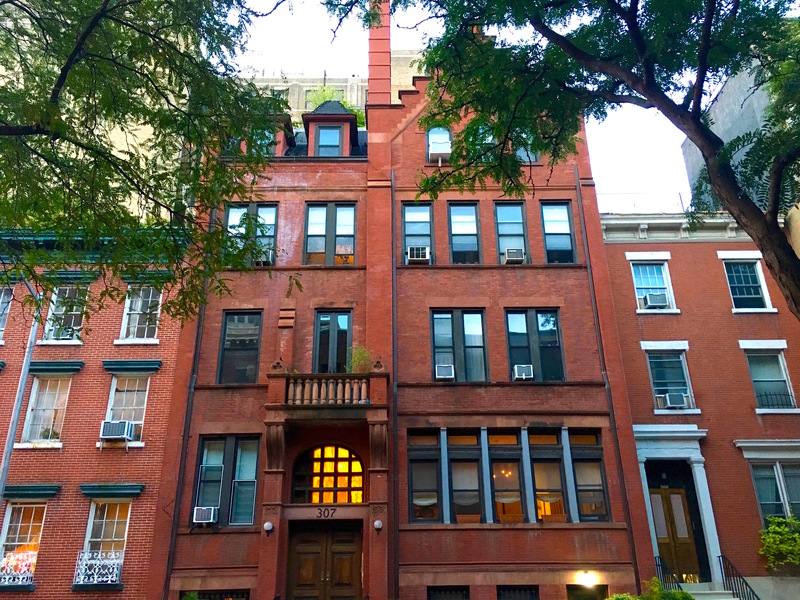 It’s the work of Calvert Vaux, co-creator of Central Park, who decades later helped design several homes for boys and girls put up by the Children’s Aid Society, such as the Lodging House for Boys on Avenue B and the Mott Street 14th Ward Industrial School, both still extant. 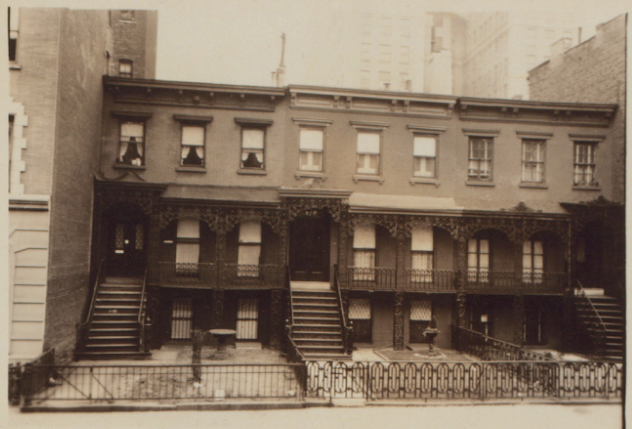 Destitute girls continued to exist in New York, but the Elizabeth Home was sold in 1930, only to be reopened as a girls’ home in the 1940s by the Florence Crittenton League, which had its roots saving “fallen women” in the Gilded Age city. 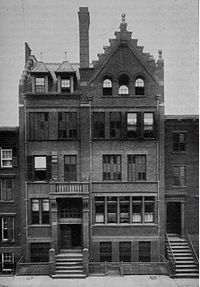 By 1982, the unusual building became a co-op. Last year, a two-bedroom on the ground floor—where the “inmates” learned typewriting and sewing—sold for $1.3 million. Streets, schools, apartment complexes, statues—you can’t escape the Stuyvesant name in New York City. These and other memorials pay homage to Peter Stuyvesant (at right), the director-general of New Amsterdam from 1647 to 1664, as well as other Stuyvesants who made a mark in the city over three centuries. 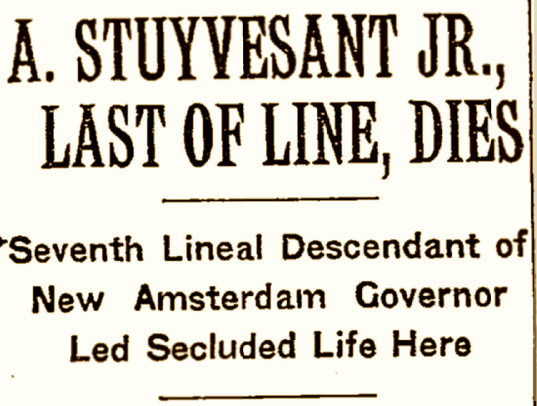 But there’s one Stuyvesant family member who made headlines for a different achievement: He was the last one, the final direct descendant of peg-legged Peter, dying at age 83 in 1953. His name was Augustus Van Horne Stuyvesant Jr. Born in 1870 in his family’s mansion on Fifth Avenue and 20th Street, he grew up in an “imposing” house on East 57th Street off Fifth Avenue. Wealthy and a resident of Manhattan’s most exclusive neighborhood at the time, Augustus lived the same life as the children from other old-money families did in the Gilded Age. Not only did Augustus not go to school, he never pursued a profession. And neither he nor his sisters married. 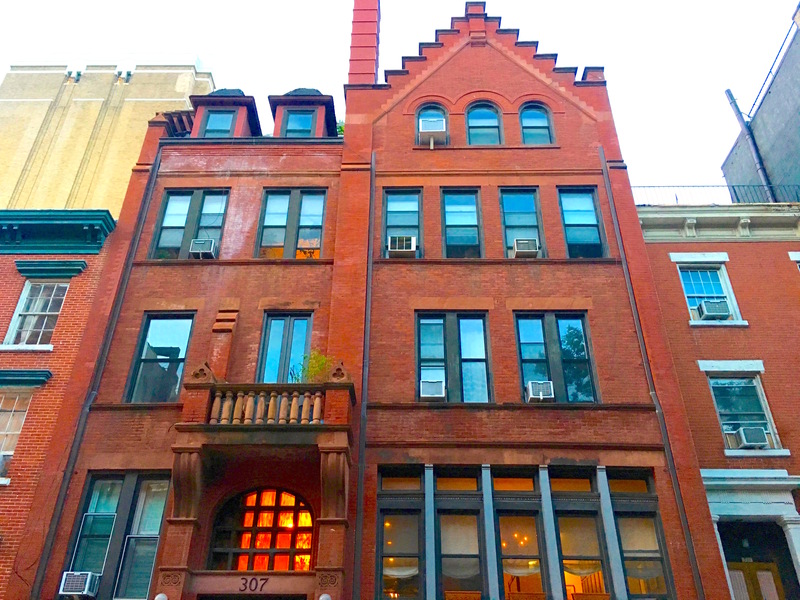 As adults, the three of them lived together in their East 57th Street mansion. The three siblings weren’t housemates for long. In 1924, the oldest, Catherine, died; youngest sister Anne’s death followed a decade later. Augustus spent the next two decades in seclusion. 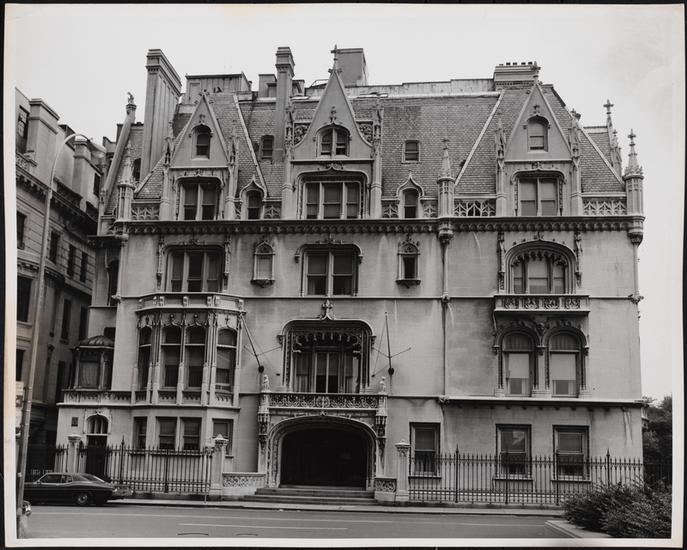 He and Anne had sold the 57th Street mansion in the 1920s and purchased a spectacular French chateau (above) on Fifth Avenue and 79th Street. 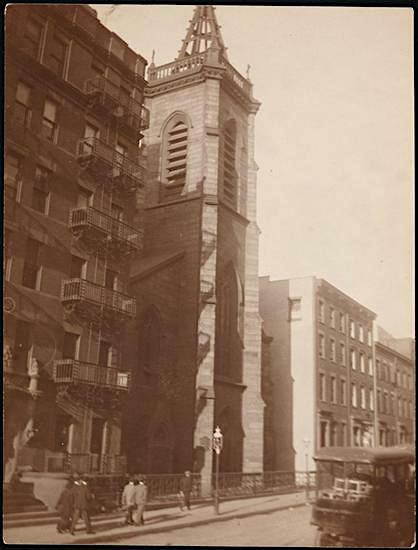 His one regular haunt, however, was St. Mark’s Church at Tenth Street and Second Avenue, where eight generations of Stuyvesants had been buried in a family crypt. “Once or twice monthly, also, a uniformed chauffeur would drive the tall, white-haired, black-clothed gentleman in an old Rolls Royce to visit the Stuyvesant tomb beneath St.-Mark’s-in-the-Bouwerie,” stated the Times. After Augustus died—he was overcome by heat on an August day while on a stroll—he joined those 80 or so relatives in the family vault. At his funeral at St. Mark’s Church three days after his death were some cousins, his lawyer, and his “ruddy-faced” butler, who “dressed in black, sat alone, weeping into his handkerchief” along with six elderly house servants, according to a second Times article. Augustus was the last Stuyvesant to go into the crypt, which runs under the east wall of the church, after which it was sealed forever. There’s a fine tenement building in the middle of East 10th Street between Second and First Avenues, one of the many tenement blocks built when the East Village was Kleindeutschland, or Little Germany. 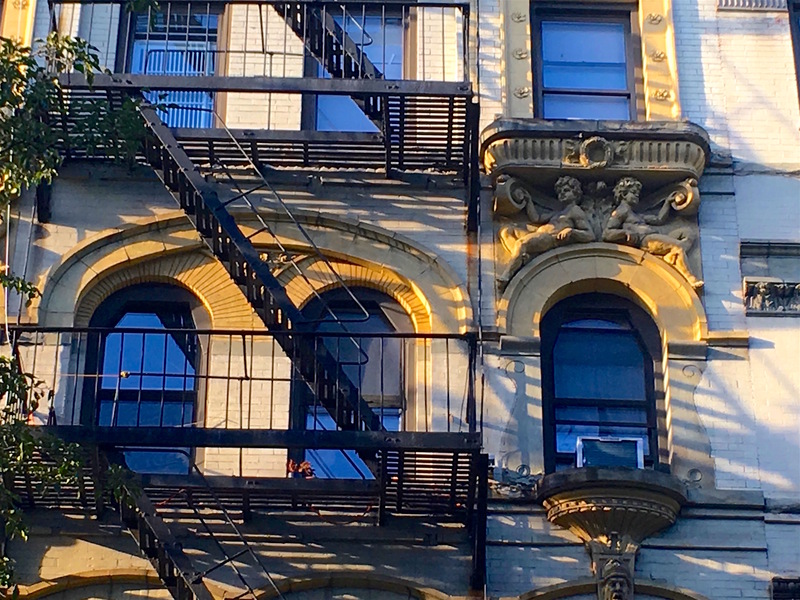 It’s the color of cream, and it looks like the rest of the tenements on the block—six stories, a fire escape on the facade, some ornamental bells and whistles like wreaths under the windows. 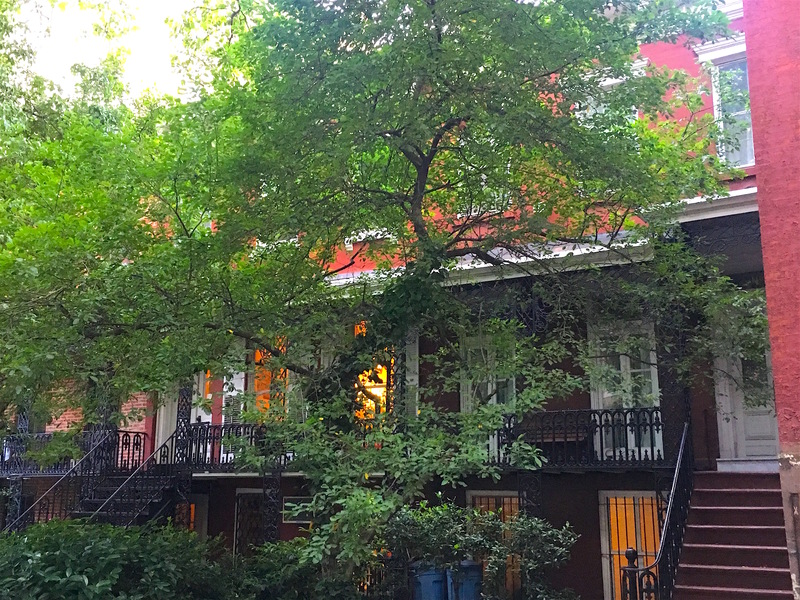 But this tenement has an extra bit of loveliness on the facade, something visible when the wind blows back the thick leaves of the sidewalk trees that normal give it cover. On the facade high up under the fifth floor windows are bas reliefs of what look like twin angels. There’s two on each side of the building, watching over the tenement and East 10th Street since 1900, the year Streeteasy says it was built. 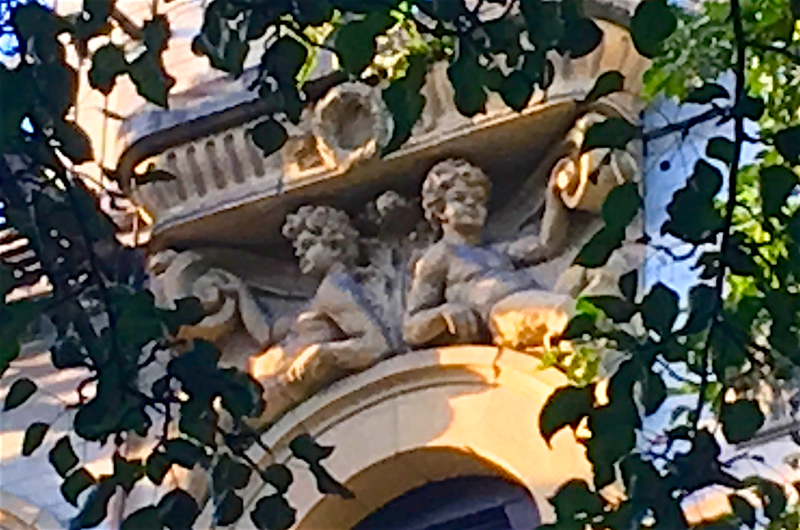 They’re not the only angels carved into an East Village tenement facade. 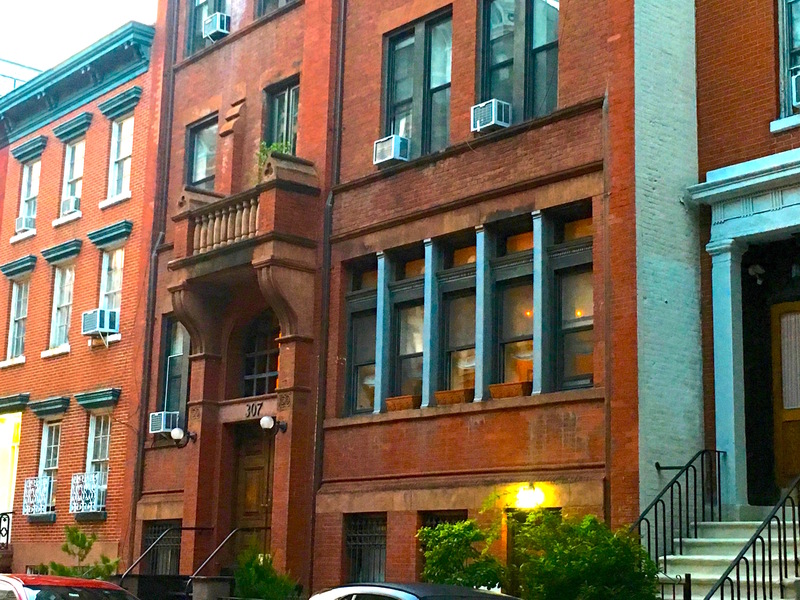 This one on East 14th Street is equally hard to see and straddles two tenements. 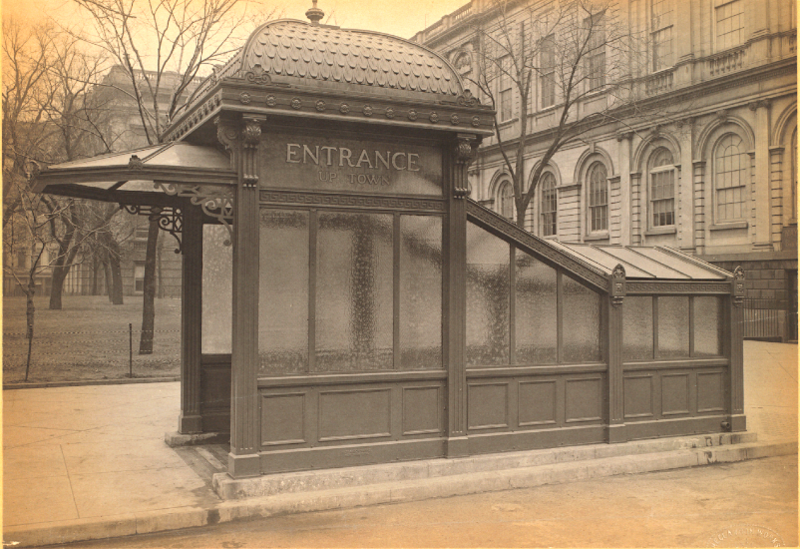 There is sits beside City Hall Park, an original New York City subway entrance—one of several entrances and exits for the new IRT subway, which made its debut in 1904. 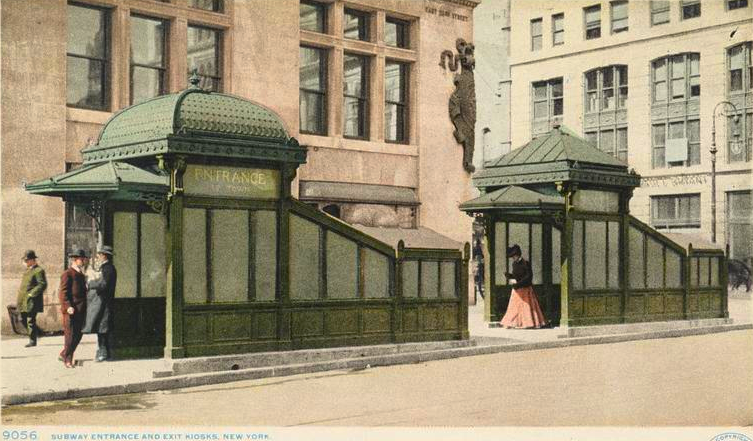 Modeled after subway kiosks in Budapest, these graceful structures (domed roof kiosks were entrances; those with peaked roofs were exits, see below at East 23rd Street) were built during the height of the City Beautiful movement that swept major urban areas at the turn of the 20th century. The idea was that public buildings—schools, courts, and subway kiosks as well—should inspire and uplift city residents. I’m not sure if any of the originals exist today. But some subways have replicas, like the one at Astor Place, with its colorful beavers on the platform. 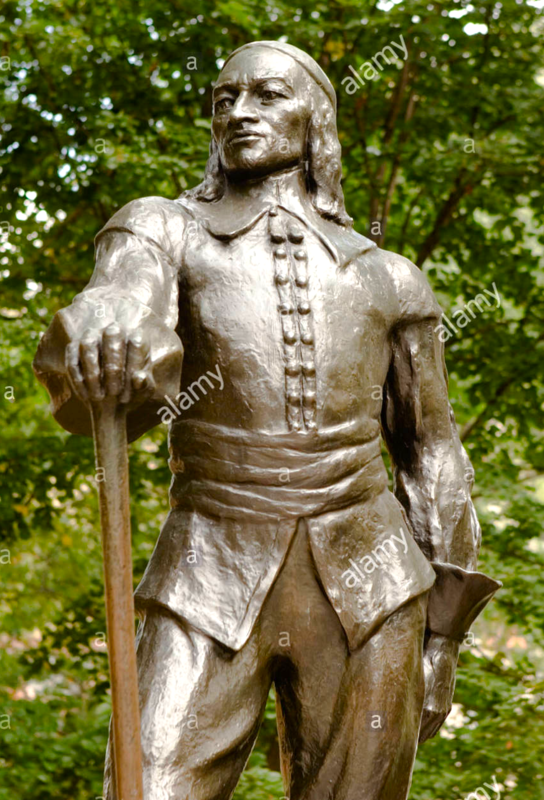 Peter Stuyvesant’s bouwerie must have been something. 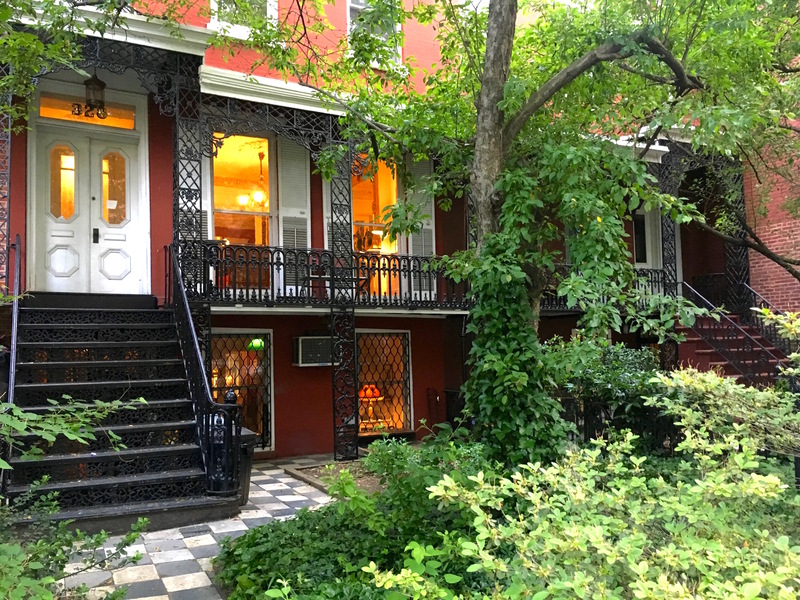 But contemporary New Yorkers can get an idea of what it looked like thanks to three charming houses on East 18th Street. 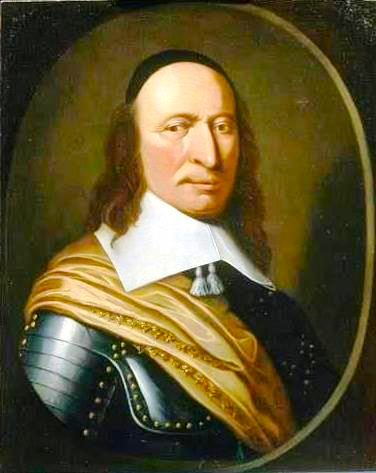 Stuyvesant was the final director-general of New Amsterdam. After the British took over in 1664, he moved out of the city center and resided on his 120-acre bouwerie, or farm—roughly bounded by today’s 5th to 15th Street east of Fourth Avenue to the East River. 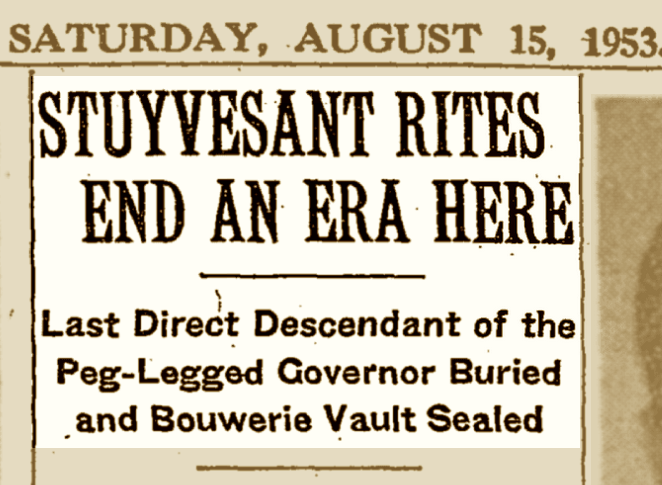 Stuyvesant died in 1672 and was interred at St. Mark’s Church at Second Avenue and 10th Street, on his bouwerie. As the East Side went from countryside to part of the city In the 18th and 19th centuries, his heirs sold off land to developers eager to put down roads and build homes for a growing New York. 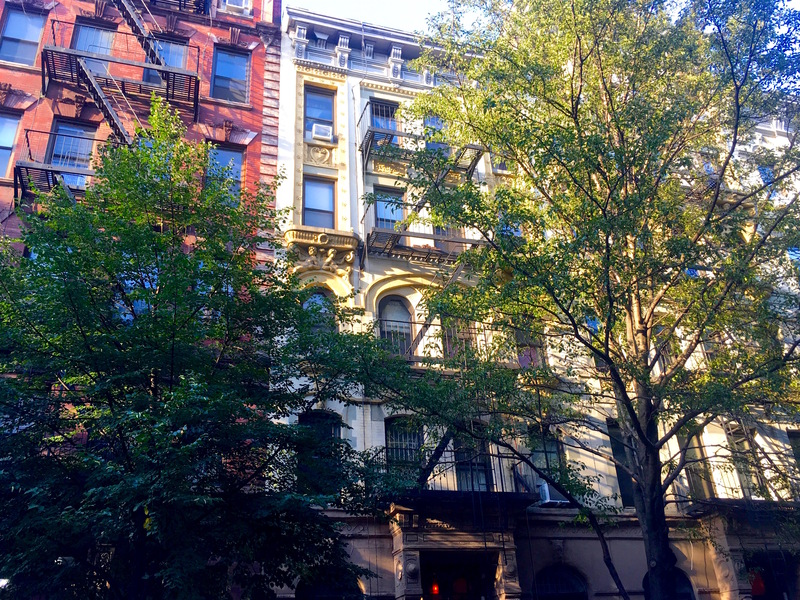 One of those heirs was Cornelia Stuyvesant Ten Broeck, who in 1852 leased land on today’s 18th Street to several men who worked in the construction trades. 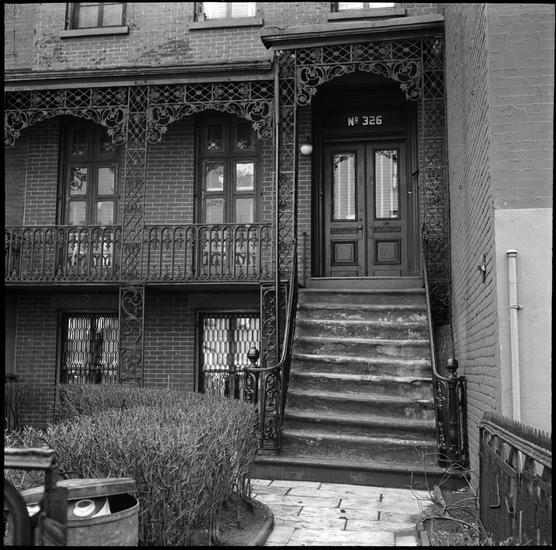 Ten Broeck stipulated in her lease that these men put up “good and substantial dwelling houses…being three or more stories in height and constructed either of brick or stone,” according to a 1973 Neighborhood Preservation Center report. 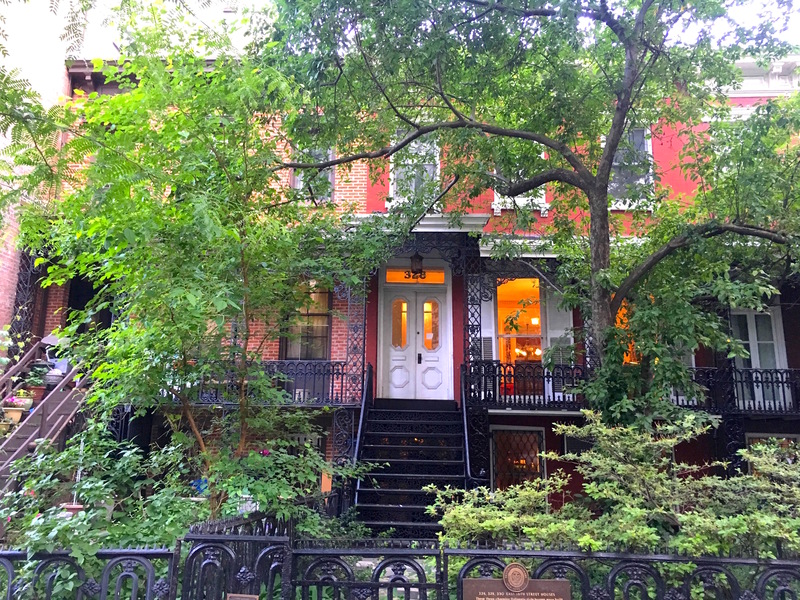 The results of that lease are still part of the city today: three lovely brick houses with vast, lush front yards and iron fences and entryways at 326, 328, and 330 East 18th Street. 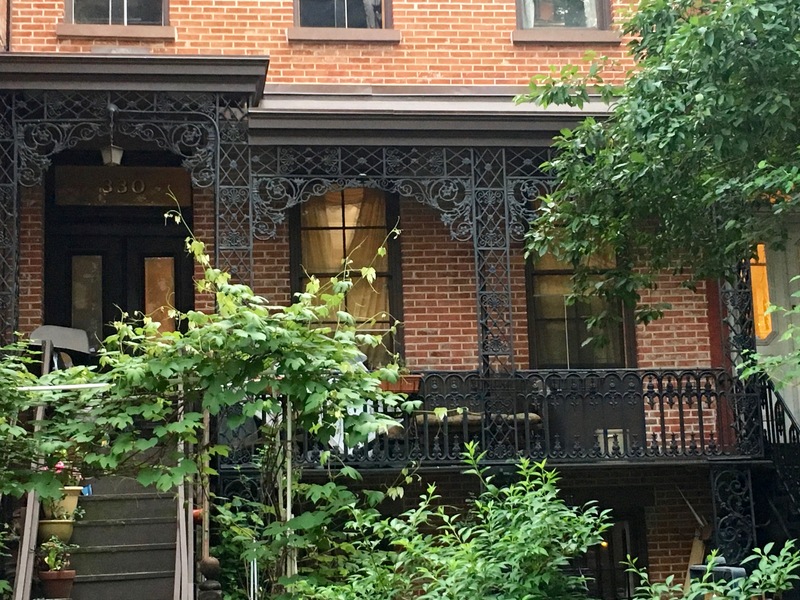 The three sister houses, built in the popular Italianate style of the mid-19th century, “recall a period when rows of one-family dwellings were beginning to line the city’s ‘uptown’ side streets from the Hudson River to Avenue A,” the NPC report says. The houses themselves are somewhat modest. But the decorative ironwork on the porches and entryways give them a New Orleans kind of feel. 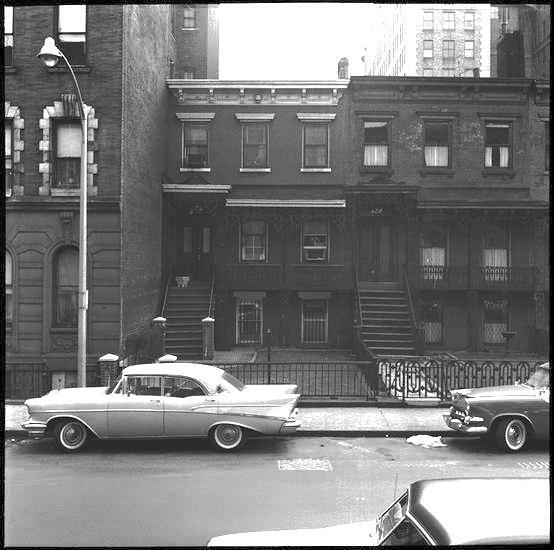 And the deep front yards are an unusual feature in Manhattan, though as the above black and white photos (from the 1930s to the 1970s) show, the yards didn’t always feature thick greenery. The trees and bushes shading our view of the houses look like they sprang up on their own, ghostly reminders of the trees and bushes of Stuyvesant’s bouwerie three centuries earlier. They lend a bucolic feel to this stretch of the cityscape . . . almost like what Stuyvesant’s bouwerie might have looked like.